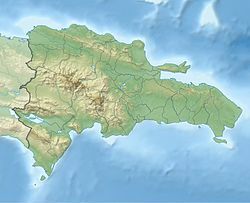 Jimaní is the capital and the second largest city of the Independencia Province of the Dominican Republic. It serves as one of the two main thoroughfares to Haiti (with Dajabón), with a duty-free open-air marketplace operating on the border with Haiti. The town suffered damages in the flash flood of May 25, 2004, which killed many citizens during the night and washed away hundreds of homes. The name "Ximani" is of native Taíno origin. Historian Rafael Leonidas Pérez y Pérez in his book "Annotations on the history of Jimaní", says that Ximani was a Cacique of the chieftainship of Xaragua who had control of the town that lied in the middle of the two lakes, Lake Enriquillo and Lake Azuei, as well as the pass that leads to Pic la Selle making it a strategical and important part of the island. The name "Ximaní" is recognized when the Spaniards signed a peace agreement with the natives through Enriquillo at "the Lagoon of Ximaní" in 1536. Another version claims the name belongs to a French Count (Count of Jimaní). Pérez y Pérez clarifies however that this official, was called "of Jimani" because of him having owned that land, which was awarded to him during the expansion of the French occupation. The historian argues that the French did not occupy the west side of the island, particularly that territory, until the mid 18th century. By the time of the Dominican War of Independence, Jimani was practically deserted with most of the fighting taking place in Neiba. After the independence of 1844 the earliest inhabitants of Jimaní came from various communities of the southwest, such as Neiba, Duvergé, El Estero, Las Salinas, Azua de Compostela, Santa Cruz de Barahona, and Haitian immigrants from the mountains that married or had common-law marriages with Dominicans, forming families in the most populous neighborhood of the community, known as Jimaní Viejo. By the 1930s Jimaní belonged to Neiba and in 1938 it became part of the commune of La Descubierta, forming a part of the Province of Baoruco. On the 18 of March 1943, by means of the law number 229, Jimani was elevated to municipal district. On December 29 1948 the province of Baoruco was split into two provinces, the west side receiving the name of Independence Province. On January 1 1950, Jimani officially became the Capital of the new province Independencia. Jimaní has a tropical wet and dry climate and relatively constant temperatures throughout the course of the year. Annual rainfall is distributed, peaking in May and October; the dry season occurs from December through February. Agriculture and commerce with Haiti represent the main economic activities of this municipality. In agriculture the main products are cassava, batata, melon, peppers, cilantro and tomatoes. Jimaní has a popular duty-free open-air marketplace with Haiti that is also visited by people from adjoining towns and even from distant regions of the country. In this market, basic food products are sold, as well as foreign beverages, clothes, shoes, and new and used electrical appliances. The customs zone of the border is called "The Door" and it is visited by foreign tourists that come to observe the dynamics of the business and intercultural and interracial relation between Dominicans and Haitians. The municipal districts El Limón and Boca de Cachón receive monthly $500,000 each one, from the transfer ordered by the law through the Dominican Municipal League. There are two financial institutions in Jimaní. A branch office of the Reserve Bank and a branch office of the Cooperative of Savings and Credit of Neiba (Coopacrene). There are six basic schools with two daily schedules and four public high schools, three of them for adults. The municipality has a municipal hospital and four rural clinics or hospitals. The majority of the Jimanisenses prefer to seek medical attention in the Regional University Hospital Jaime Mota of Barahona. Jimaní is mostly Catholic. Local holidays are celebrated March 19, in honor of their Saint San José. A carnival is being added to the Patronal Feast, to expand the celebration. Also being instituted is the celebration of a Cultural Week each year, in memory of the flood that destroyed a big part of the population in May 2004. As a historic-cultural monument, Jimaní conserves intact and conditioned the "Mansion of Trujillo", one of many the dictator built in the border region, although he never spent the night in this particular one. Local governments have carried out different works for the community, such as the reconstruction and restructuring of the municipal cemetery, the reconstruction of street gutters, rehabilitation of electric lighting in the urban area and in the sector of Tierra Nueva. There are also ongoing projects to enlarge the aqueduct network for the neighborhoods of La Cu and El Cerro. In Jimaní there are several community associations. For example, in each of the towns that conform the municipality there is an Association of Farmers as well as an Association of Mothers. There is also a Lions Club, the Association of Minibuses Jimaní-Barahona, a committee that represents the Association of "Jimanisenses" in Massachusetts, US, a technical team of World Vision, Fundasur (Foundation of the South) and Conani (the National Council for Childhood and Adolescence). ^ "Tu municipo en cifras, Jimaní" (PDF) (in Spanish). Oficina Nacional de Estadistica. Retrieved February 20, 2015. ^ Weiner, Tim; Polgreen, Lydia (May 28, 2004). "Grief as Haitians and Dominicans Tally Flood Toll". New York Times. Retrieved February 25, 2015. ^ "Jimani, Dominican Republic". Climatemps.com. Retrieved February 20, 2015. ^ "Jimaní Climate Normals 1961–1990". National Oceanic and Atmospheric Administration. Retrieved March 23, 2015. ^ "Normales Climatológicas" (in Spanish). Acqweather. Retrieved September 21, 2016. This page was last edited on 4 December 2017, at 22:32 (UTC).